Community Solar Farms make solar energy possible for those who are unable to install it on their own property. Each participant owns a share of the solar project and receives the same financial incentives as someone who puts solar panels on their own roof. If you sell your house and move within the region of your utility company (Emera), your community solar share comes with you. If you need to move out of your utility's service territory, you can sell your share to another person. A solar array is to be installed by ReVision Energy on the property of Kim Peralta in Brooksville. 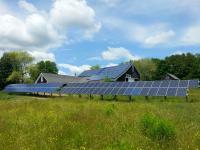 Interested parties should contact John Luft john@revisionenergy.com 207.589.4171.